DISTORTED ICHTHYOSAUR VERTEBRA - JURASSIC LYME REGIS. Ichthyosaurus cf. communis De la Beche & Conybeare. Matrix free slightly waterworn vertebra found on the beach. The vertebra has been distorted by crushing post mortem. Lovely condition. 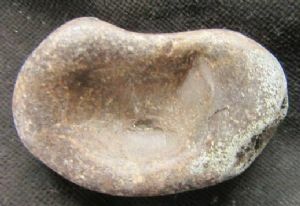 vertebra : 5.5 x 3.2 x 1.7 cm.